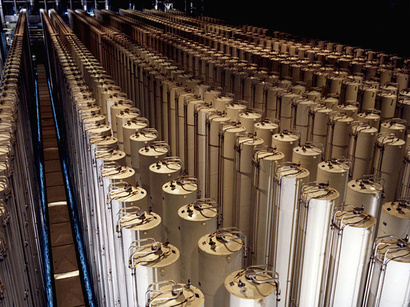 Iran’s outgoing director of Atomic Energy Organization of Iran (AEOI) Fereidoun Abbasi said today in Tehran that the country has 18,000 centrifuges at its uranium enrichment plants. The number is higher by a third than publicly known. Abbasi’s announcement came as he handed over his post Saturday to Ali Akbar Salehi, the former foreign minister who was appointed by President Rouhani to head the AEOI. Abbasi said 10,000 centrifuges currently operating are of the older model IR-1, while about 7,000 more of the same model are ready to be installed along with just over 1,000 centrifuges of an advanced new model, IR-2M. In its latest report, the IAEA stated that at Natanz for just Production Hall A, Iran has submitted plans for 25,000 operating centrifuges. So a current figure of 18,000 shouldn't be "surprising". Not the future plans, but the actual number of machines in operation or ready to be installed was not know publicly before this announcement.